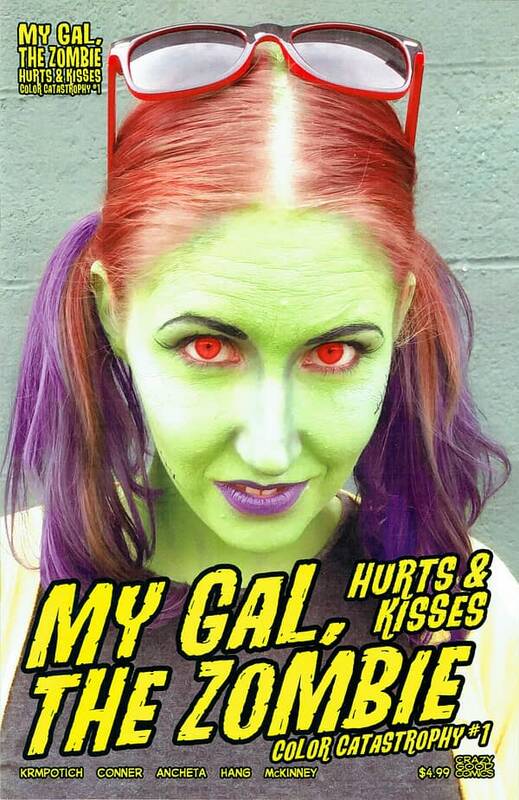 My Gal The Zombie is the story of Chelsea, an ordinary teenage girl with ordinary problems – who also happens to be a zombie. But she’s not going to let being a zombie ruin her afterlife! 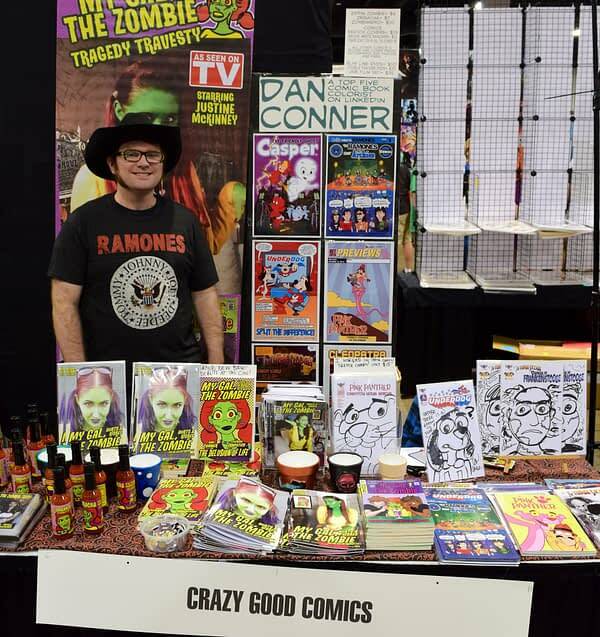 The creator of the series, Dan Conner, has been working professionally in the comic book field since 2002. Working primarily as a colorist (though his credits also include writing, illustrating, and editing), he has done projects for Antarctic Press, Lamp Post Inc., American Mythology Productions and Scholastic/Graphix. 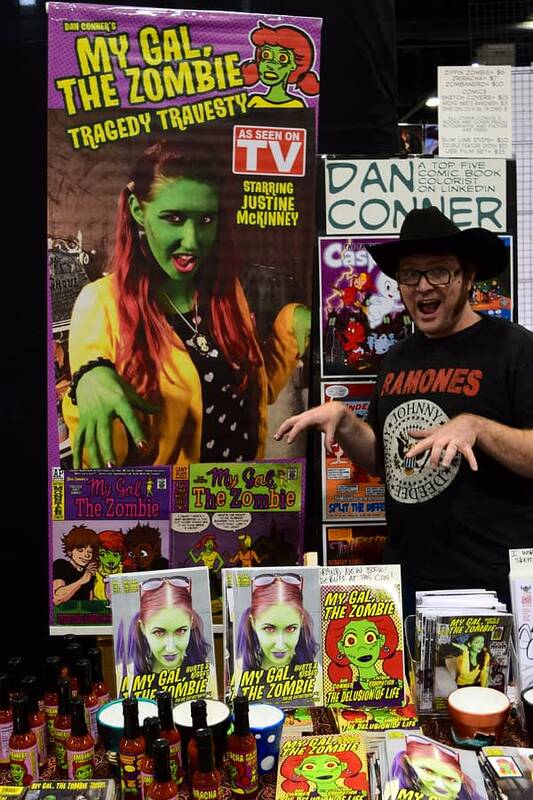 I had the chance to talk with Dan at the Denver Comic Con last weekend. 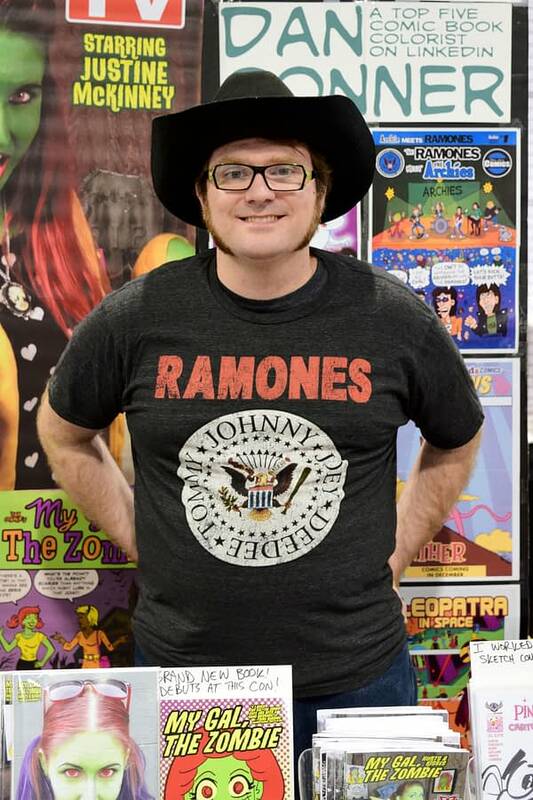 We discussed his zombie comics, his work as a colorist, his line of hot sauce, and how he came to work on an Archie Meets The Ramones cover. 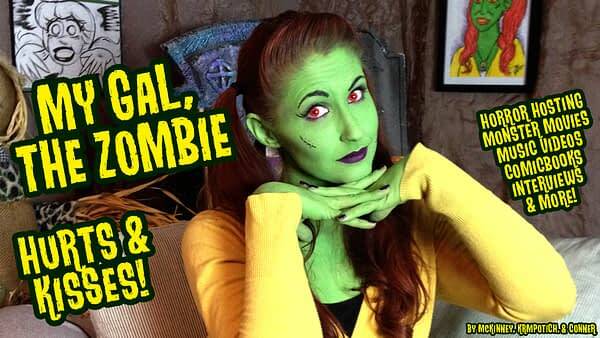 Bleeding Cool: Can you start us out by letting the readers know what My Gal the Zombie is about? Dan Conner: Definitely. I started by doing a zombie version of a character named Chelsea (from the Heaven Forbid series that I did), I did a story about her and it’s kind of ballooned from there. 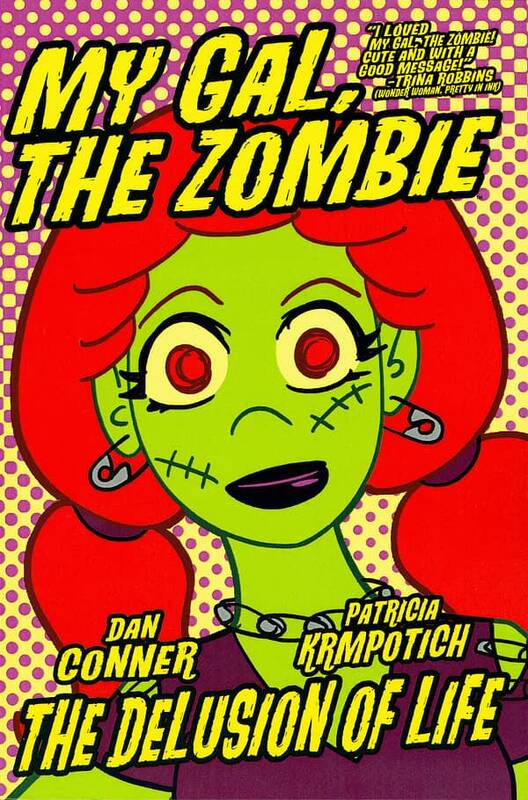 It’s about a young lady – around 19 years old – who became a zombie, but didn’t want to have to give up on her friends and they were willing to stick with her. Sometimes they’re facing another monster that she can kind of stand up and defend them from, and other times they are trying to figure out what to do on Valentine’s Day. BC: Do you release the stories as single issues or as graphic novels? DC: The first book we did, I made mini-comics that I just printed and made at home. Then I did a graphic novel. And just over a year ago I started doing more black and white mini-comics. We did those about once a month. We are still doing them, but I think we got through about 9 issues in just under a year. Then, my friend Bob Conway (of Avanti Printing and Bubble Gum Comics) had some really good prices for printing color. I really like to do coloring so we did some stapled floppy comics in full size & in color. This is first time I’m doing full size color floppy comics on my own and it’s going good. I like it. Then I have the new graphic novel and that’s black and white and the main reason is just economics. It’s so much cheaper. 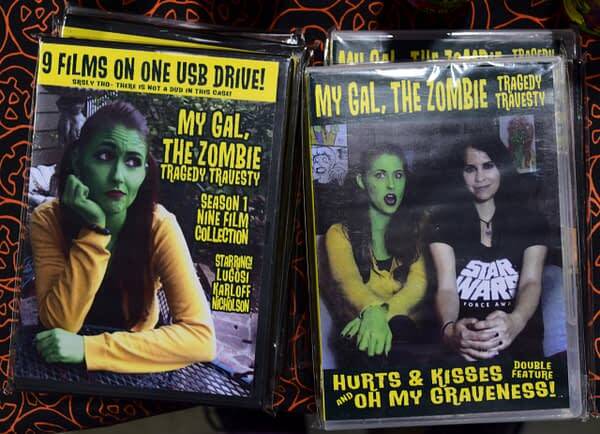 BC: Can you tell me a little bit about the My Gal the Zombie show? DC: After I started doing the comics I really wanted to do horror hosting. I had been trying to think of different ways to go about for years. So Justine McKinney reached out to me – she had backed our Kickstarter back in 2013 or so. She sent me a photo of herself in character and it was perfect. There was someone else I had been talking with, but that didn’t pan out so the timing with Justine was perfect. So we started filming. We did a holiday special for Christmas that year, 2014. Then shortly after that we heard from The Bone Jangler who does horror hosting in the Chicago area of Illinois. He said that if we did non-holiday stuff he would get it on the air. We were going to do a season or so and then try to get air time, but he offered that to us first. So we did the first season and that went pretty good. We just learned as we went. First we did some Bella Lugosi movies, then we did Frankenstein’s Daughter, Night of the Living Dead, and K. Gordon Murray’s Santa (the one where he’s fighting Satan). We hosted those movies. Then we did a Kickstarter for the 2nd season and a lot of it is filmed but we are still editing. We’ve also been on TV as well all throughout Illinois; we are on sometimes in Milwaukee right now. We’ve been on in the Denver area – that also reached Nebraska and Wyoming. Also we are on some ROKU channels and then some internet channels. A lot people have come to us and I don’t want to say that we are in demand, but the horror hosting community is really tight knit online and it’s a ton of fun. There are some channels like The Vortex or The Creepy Castle and we’ll be on those and we get rotated with other stuff. That community is really supportive. I thought we were really going to have to chase after that but people just really dig the medium. 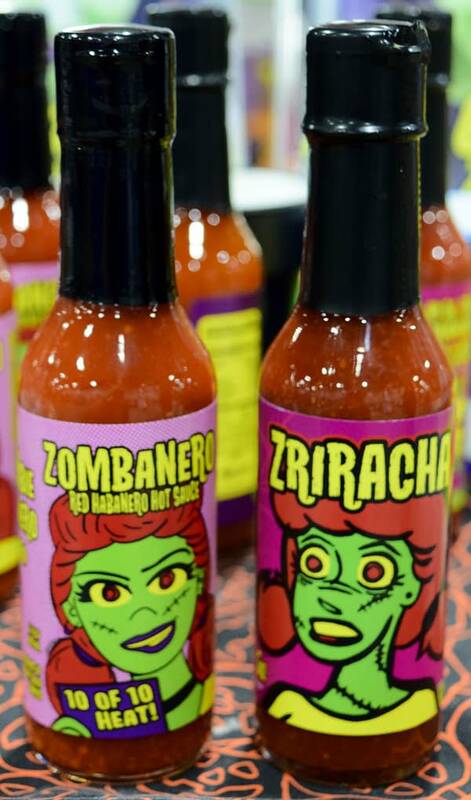 BC: I also see that My Gal the Zombie also has a line of hot sauces, tell me how that came about. DC: Yes we do. This is when I was going to Discover the Earth church. I was going there in Denver and I met with the pastor one morning for breakfast and he said “Hey, that guy Danny Cash who goes to the church, his store is just down the block and he does hot sauce and it’s just amazing”. So one of my first questions for him was how do you get your labels? They said they have their own graphic designers but that people could private label, a lot of restaurants do that. What I did was got him art that week so that I had some ready for Denver Comic Con 2013. I have had a Zippin’ Zombie that I have had every year. We did a Sriracha one. Then I did a habanero one after that that I called Zombanero that was like a Cajun habanero. Then we did a pumpkin spice habanero. The Cajun and the pumpkin spice habanero are sold out. Now I just started a red habanero and that one is just called Zombanero Red. I just got those today but they are great fun and I figured at a comic convention there are some people who aren’t here for comics you know? A lot people dig them and they taste good. BC: I know that you have been doing a lot of work for other publishers lately. Can you tell us a little bit about what you’ve been doing? DC: So Adrian Ropp’s been a pal of mine for a few years. I love the guy, he’s great. Last year – after Denver Comic Con – we were talking. He and a couple of my friends who do a lot of Archie stuff had started working on Pink Panther for American Mythology. Then I learned that they were also working on The Three Stooges. I was able to show some of my coloring stuff to them and I started on Three Stooges Election Special last year. It was called Red White and Stooge. I think that I have done at least a story or colored some pages in every Three Stooges issue since that one. After I did that then I got some Pink Panther stuff and I’ve been on pretty much every Pink Panther issue since then. I did write and draw an Inspector [Clouseau] story that was in the Cartoon Hour Special and I’ve done some inking for Bill Galvan on Pink Panther. I’ve also done some inking and coloring on Underdog, I was in the FCBD issue of that. That was a ton of fun. I’ve colored one piece for Casper and that new Casper book should be coming out soon. I have done some stuff for Equilibrium and a little bit for Stargate. I have been doing a lot for them and really enjoying it. I have been trying to work for Archie for years, and you know they have a lot of great stuff they are putting out. So when this opportunity came up for Archie Meets The Ramones, I did all I could to get in on it. BC: That’s a really cool project. DC: Yeah it’s the best one. I was talking to everybody like, “Hey, what do you need? What can I do?” And everybody said, “Oh, it’s taken care of.” Meanwhile, shortly before it was supposed to come out, a pal of mine (Batton Lash) mentioned that he knew John Holmstrom – who founded Punk Magazine and did some early Ramones record covers among other stuff. So I friended John on Facebook and we started talking. Then a couple months later he posted that he was drawing a cover and I asked who was coloring it? Then I reached out to the store that was doing that exclusive. It’s one of the lowest prints of an Archie book ever, one of the rarest exclusive variants. It was for Main Street Comics in New York. But I got to color it and work with John Holmstrom. Working on Archie Meet the Ramones was so much fun because I love the Ramones, they are my favorite group and I really got to have fun with it. BC: Moving forward, where do you see My Gal the Zombie going? DC: I’m not sure. We are now doing these color issues. I really like color. I figure that we will keep doing those. I would love to have it out through Diamond [Distribution] and I’m always talking with different folks. The first book out was with Antarctic Press through Diamond. I would I like to see the book more widely distributed to folks but I’m happy with what it’s doing now. It has just about tapped the resources that me and Justine and Patricia can offer. So the plan is just more of the same, refining and learning what’s best. I was doing a lot of merchandise before, we had eye shadow and lip balm and hair clips. Those are all great fun but I’m just streamlining it with comics, DVDs and hot sauce. BC: You told me a little bit about Justine, what can you tell me about the other member of your team Patricia Krmpotich? DC: So she came on to help with the show at least two years ago. So she was helping us with production and stuff like that. Then she mentioned writing, and she was coming up with stuff while we were filming. She wrote some parts and they were really good, I thought it was as good as anything I was writing. Then she wanted to write some comics. So she has pretty much taken over writing the comic series and it’s good for me because she has a lot more ideas than I do. I wrote a lot of what I wanted to, and now I’m just letting her take the reins. Sometimes she will get someone else to draw and I will color it and then sometimes I will draw it as well, but it’s really easy when you just need to color something. I’m finding that I really like the coloring because I can let other people draw it. BC: Are you available for other coloring projects if people reach out to you? DC: Yeah, definitely! I also do flat colors for Cleopatra in Space with Mike Maihack and Scholastic. I love that. So if anybody is interested, I pride myself in being fast, economical, and good. 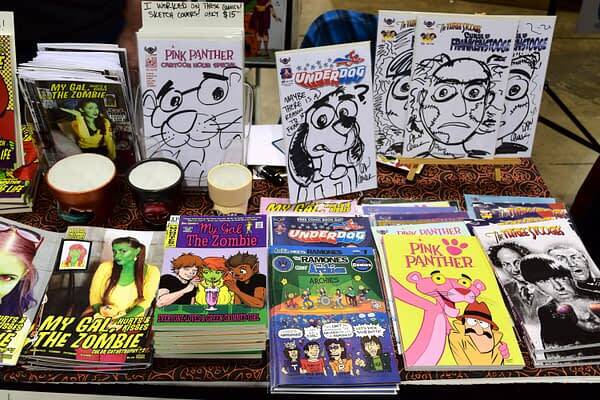 At the end of the day I want to be glad to have a page at my table and I want to be proud of what my name is on. Sometimes that means just spending some more time on it and I would rather do that. So please contact me at dan@crazygoodcomics.com . BC: Are there other places online that people might find your work if they wanted to see more? DC: Yeah, mygalthezombie.com , Facebook, Instagram (Justine’s account) has almost 30,000 followers. She does a lot of other makeup tutorials and all sorts of things. That is also her handle on Twitter @mygalthezombiefx. I am @crazygoodconner on Instagram and Twitter. Patricia is @thexzoomxcat on Instagram and Twitter. We have a channel on YouTube. Oh and crazygoodcomics.com also.